There are various ceiling fan brands on the market and choosing the best can be quite a challenge. Each of the brands has a number of ceiling fans you can choose from and these fans vary in size, performance, and quality. There are manufacturers who are known for making lower quality affordable fans. There are also those who are known for producing high-quality premium fans. Within every brand, you will find major differences in quality and performance among the various fans produced by the brand. Most of the brands will, therefore, offer you relatively equivalent fan models depending on the category you choose. I know how hard it can be to decide which brand is better than the other. This is the reason I have compiled a list of the best ceiling fan brands to help you narrow down your options. I used various factors like appearance, price, durability, design, features, and ease of use to give you as much information as possible so that you can pick a brand that matches your demands. Minka Group produces some of the very best units you can get on the market. Their fans are built with an artistic design using high-quality materials. Despite being fashionable, they are quite pocket-friendly when it comes to price. The quality materials used on these fans ensure wonderful finishes and long-lasting properties. They come in distinctive styles and tones that can easily fit in any environment. In terms of aesthetics, the brand produces some of the industry’s most attractive ceiling fans. Some of its fans fall on the best-rated lists based on their aesthetics. If you need the get both the cooling functionalities and beauty at the same time, then Minka Aire fans are worth considering. Their colors are not too overwhelming, making them blend well with your home theme. They use unique blade shapes to give you more personalized designs. These fans don’t disappoint in other aspects like energy efficiency and airflow ratings. This brand, therefore, offers you fans that are not only beautiful but also produces adequate airflow and consumes less electricity. The Casablanca brand is known for producing fine quality ceiling fans with a simple elegant design. The company behind this brand was founded in the 1970s by Burton A. Burton, an entrepreneur who thought that fans should be more than mere cooling devices. Mr. Burton founded the Casablanca brand on the principle of design and went on to produce great ceiling fans. These fans have a unique design style that places them up there with the very best. Casablanca brand has maintained its consistency in giving customers the best workmanship in terms of materials, looks, and design. The fans are composed of high-quality wood fashioned blades that supply sufficient air even in a large room. they may be slightly expensive but considering the performance and the durability aspects, it is a worthy investment. These fans add instant class and charm to your home with their traditional and world-class wood theme. The brand has a premier in-house design team that has helped it establish a long-lasting precedent in the industry. They have lived to their mission of creating authentic, original and high-quality fans. The team gets inspiration from various sources including history pages, art exhibitions, and visiting remote islands. The Hunter Fan Company established a new standard for craftsmanship and quality about 128 years ago. The brand has continued to innovate around the area of overhead fans as they seek absolute perfection. In order to remain on the innovative side, the brand incorporates latest technologies, trends, and aesthetics in the design of their fans. There is a rigorous in-house testing process that ensures that only stellar products end up in the market. Unlike most brands on the market, the Hunter brand seeks to maintain a great balance between price and quality. This is meant to meet the needs of the middle-class people who may not afford the more expensive high-end brands but want something better than a budget ceiling fan. The ceiling fans of this brand are made from durable materials. Most of their fans are Energy Star certified which means that they can deliver good wind speeds without using a lot of power. The brand gives you the option to choose between the classic and the contemporary fans. The classic fans use the same old-world looks and wood blades like Casablanca brand while the contemporary fans use an updated design with modern looks. Both options use the same standard of precision and engineering. 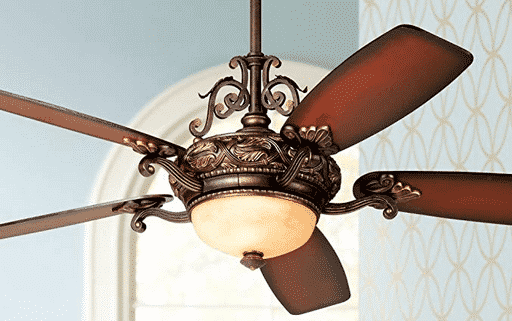 The Emerson company produced the first AC motor fan in 1890 and has since continued to produce quality ceiling fans. The company keeps on updating its motor design, aesthetics, and construction materials to retain the quality craftsmanship and efficiency standards. The fans within the Emerson brand comes with high airflow ratings but do not compromise on energy efficiency. Their fan products can be summarized as powerful, durable, and long-lasting. The brand uses heavy duty motors in the design of their ceiling fans. The brand offers some of the best figures in the industry with the average rating for their fans being 99 CFM per Watt. Most of its fans have been fitted with K55 ceiling fan motor. This motor is among the most powerful ones in the market and has the capacity to provide sufficient power for a steady consistent airflow for any room size. The power of the K55 motor has made it a popular choice for even other brands within the market. Being an established brand, Emerson has no problem sharing its parts with other brands. If you need a powerful ceiling fan for your cooling needs, then the Emerson brand is the best choice for you. The Monte Carlo brand produces unique and functional ceiling fans. These usually have a unique natural style and innovative modern design that can easily fit into any home decor. The brand uses quality components in the design of its ceiling fans to suit a specific mood setting and add the desired functionality of a ceiling fan. The brand offers affordable models with exceptional value to your home. Just like the Minka Aire models, this brand has unique shapes and styles of its fan blades. Most modern homes and buildings prefer Monte Carlo fans because of their modern look, decorative styles, and fashionable blade shapes. The brand has many models that would fit even in a traditional home setup. Their classic wood fans can be used as grand chandeliers as well. They also offer minimalist fans that come with a sleek blade shape. Their wind power generation abilities are also quite impressive. They also perform well in terms of airflow and energy efficiency. The fans of this brand have what it takes to be categorized among the best ceiling fan brands on the market. One thing that will capture your attention as far as this brand is concerned is its distinctive design. They also perform their work pretty well. Westinghouse is a renowned brand as far as reliability, innovation, and provision of high-quality products is concerned. It combines rock-solid dependability and groundbreaking technology to manufacturer some of the best fan models in the market. The brand doesn’t specialize on ceiling fans alone but also on other electrical appliances. Their high-quality appliances are also energy efficient. They manufacturer different fans that can be used for different purposes. The brand offers some of the best-rated fans in both the outdoor and indoor categories. You can get fans for both lower ceilings and high ceilings. The ceiling fans within this brand use DC motors and an upgraded lighting technology. The brand has one of the broadest collections of ceiling fans as they seek to provide solutions for the various consumer needs. The company also offers one of the widest variations of blade lengths in the industry. The brand believes strongly in creating different fans for different types of rooms. If you need a fan for a large room like a living room, this brand will offer you a large fan that is powerful enough to meet its airflow needs. If you need one for a closet or even a laundry room, this brand has a compact ceiling fan that meets that need. All the fans have been built using the same quality materials. They also use advanced engineering technology that makes them durable, powerful, and energy efficient. A ceiling fan is a perfect substitute for a costly air conditioner. It is more attractive than an AC unit but also uses less energy to give you the same cooling effect. Fans have evolved over time and now includes more energy-efficient features and modern aesthetics. There are many fans on the market and choosing one can be quite a challenge. The four main factors that should guide you in choosing the best model are efficiency, motor, airflow, and design. The six brands we have shared in this article meets these criteria and have some of the best fans within the industry. These brands have a wide variety of ceiling fans to choose from and have been specifically designed to meet your needs.